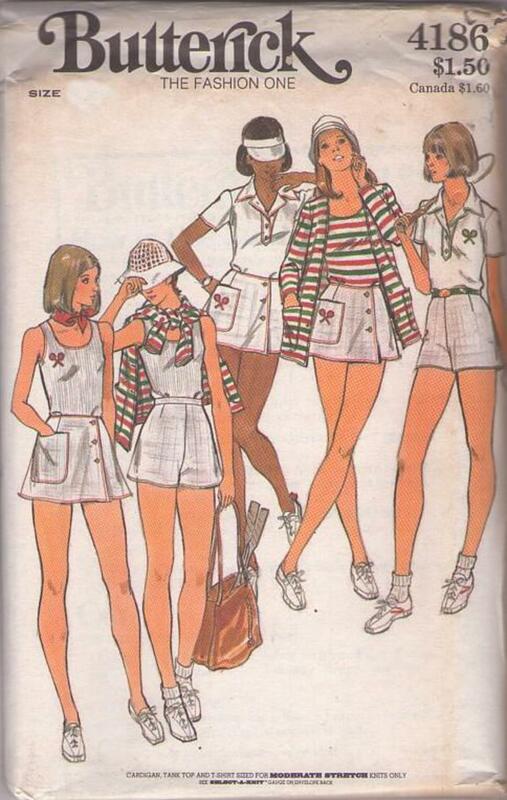 70s Sportswear, Retro Summer Separates Clothing Patterns - MISSES' CARDIGAN, TANK TOP, T-SHIRT, SKIRT, BRIEFS & SHORTS Semi-fitted cardigan has full-length sleeves and patch pockets. Close-fitting, tank top has scoop neckline and cut-away armholes. Close-fitting T-shirt has pointed collar, buttoned placket opening, and short sleeves. Front wrapped A-line skirt has side front button closing, patch pockets, and shaped waistline. Lined briefs have elasticized edges. Straight-legged shorts are darted into waistband. Topstitch trim. With or without purchased appliques, visor, belts and scarfs.